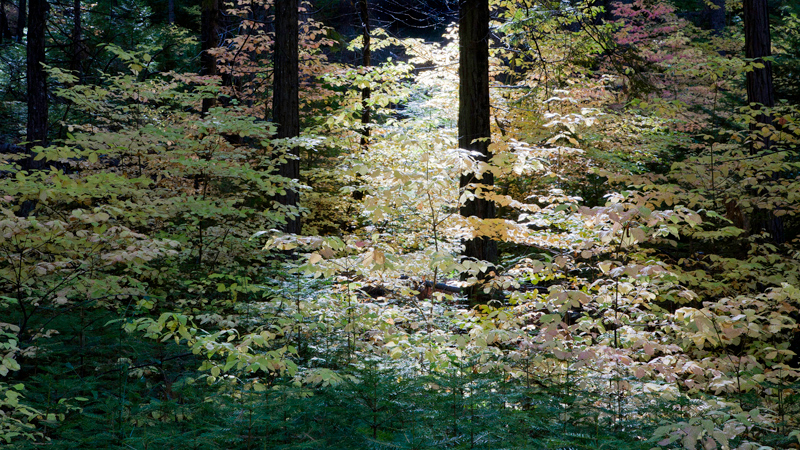 This is what you get when sunlight creeps through to the forest floor while photographing in the woods. It can be a bit much to control the contrasting light but if there are particulates in the air or fog, the light can take on the appearance of a beam. Well, no such luck here. We shot this area while en route to Yosemite to shoot fall colors. The idea was to experiment to see if we could control the contrasting light in the scene. Not even close. This is a blend of two images created from a single raw file processed with two different exposure settings. This image has a mysterious quality that lures me in as my eye wonders around the scene. We re-shot it under overcast skies a couple days later and, without the sunlight peeking through. Well, it just ain't the same. Hey, it's a jungle out there! A polarizer was also used in this shot.